For the price of a few cans of Bush's Beans, race fans can experience a full day of on-track action at Bristol Motor Speedway. 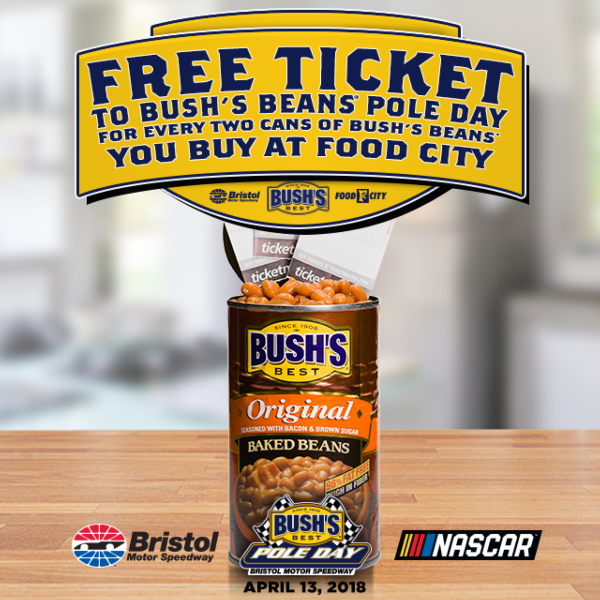 Between now and April 13, fans can get a Bush’s Beans Pole Day ticket for every two cans of Bush’s Beans products purchased at any Food City location. 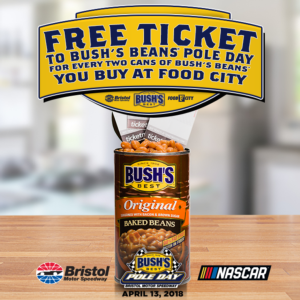 Fans wishing to exchange their Food City receipts for tickets may do so on Bush’s Beans Pole Day, Fri., April 13, at any open Bristol Motor Speedway ticket booth or the main ticket office. Redemption in advance of Bush’s Beans Pole Day is permitted by visiting the Bristol Motor Speedway main ticket office located in the lobby of the Bruton Smith Building. Bush's Beans Pole Day includes Food City 500 and Fitzgerald Glider Kits 300 practice as well as Monster Energy NASCAR Cup Series qualifying. The evening concludes with the fan-favorite Food City Family Race Night in Bristol’s Hospitality Village. Tickets for the Food City 500 weekend are still available and fans are encouraged to buy them before April 1 when adult ticket prices increase. Kids’ tickets (12 and under) are free and adult tickets are $5 for Friday’s (April 13) Bush’s Beans Pole Day. On Saturday (April 14), kids' tickets are free and adult tickets start at $30 for the Fitzgerald Glider Kits 300 NASCAR XFINITY Series race and the Zombie Auto 150 NASCAR K&N Series event. On Sunday (April 15) adult tickets start at $60 (until April 1) for the Food City 500 and kids' tickets are $10. For all races, each child must have a physical ticket in hand to enter the gates. The Bristol Motor Speedway ticket office is the only authorized location that can produce the free kids' tickets. To purchase tickets to the Food City 500, please call 423-BRISTOL or buy them online at www.BRISTOLTIX.com. Tickets can also be purchased directly from any neighborhood Food City store.